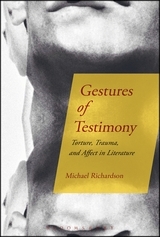 just published a review … | rebecca a. adelman, ph.d.
… of Michael Richardson’s astonishingly good book, Gestures of Testimony: Torture, Trauma, and Affect in Literature. My review is forthcoming in Cultural Studies, but is available online in advance of print publication. < Previous because who wouldn’t want to fight patriarchal power?